From Just Paper And Tape!" Hi! 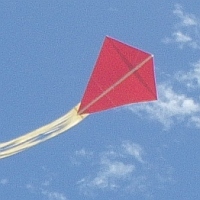 I'm Tim Parish, a 50+ 'kite nut' who has researched many designs over recent years. 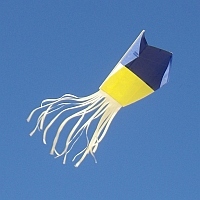 And made quite a few kites of my own, of course. 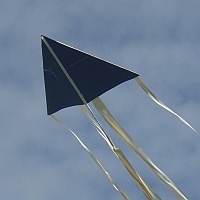 You can make some fine-looking kites by using colored paper. See those in-flight shots of them all, just down below. 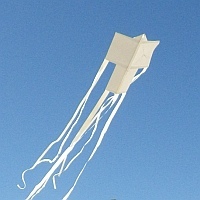 And of course, you could make the kites with plain paper and then add your own art with pencils or felt pens. The Sled is the quickest and easiest. Needing a minimal amount of tail it will soar up in a stable fashion just as soon as it pops open in the breeze. 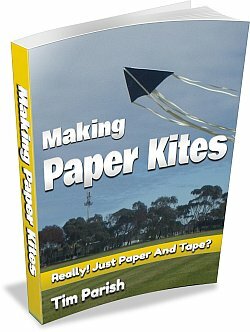 The Diamond introduces you to all the basic techniques for making the more advanced all-paper sparred kites in the Paper Series. The Diamond is a good little flier, fully capable of soaring around at 300 feet above the ground in a Gentle to Moderate breeze. On perhaps 400 feet of polyester sewing thread. You might take a fancy to one of the other types simply because it looks different. Or you might choose to stick with the more familiar with the Delta! They all move around in the air with their own little quirks - but each one will stay up and fly 100's of feet high in a smooth steady breeze. Putting one of these Paper Series kites together is a bit like model-making! There's some serious builders' satisfaction to be had, if you do an accurate job and then lavish just as much effort on the decoration. You've got yourself a little model plane that can't get away! In this world of retail consumerism, onlookers will be a bit puzzled... They can see it's just paper - but did you really make it yourself? And of course it's so satisfying to fly something you did make yourself. Even if it took a bit of e-book help. Hey, it has to be the most mundane materials list for kite-making ever! Whatever country you're in, it can't be too hard to find copier paper and sticky tape. 250+ pages of paper kite goodness! 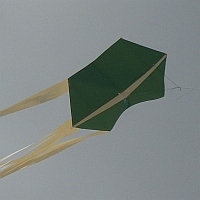 5 kite designs, covering some of the most popular sparred kite shapes. More than 330 illustrative photographs, most of them close-ups.